Spring is the season for hosting brunch. Whether you are having company over for the first day of spring, Easter or Mother’s Day, I have tips on how to make it perfect. 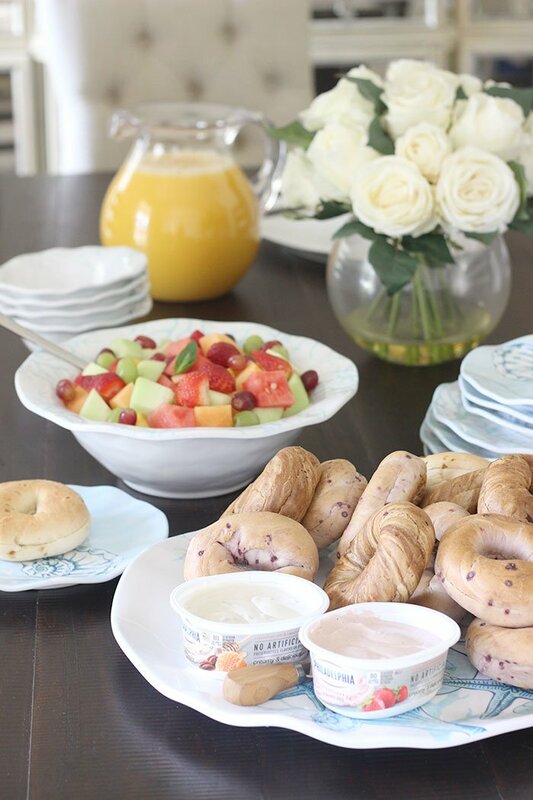 Today, I’m sharing ideas on how to host brunch that are no fuss, simple and elegant. For a perfectly elegant affair, it all starts with amazing dinner and serveware and ends in great conversation with full bellies. This is a sponsored post featuring the Captiva Collection from Q Squared NYC, all opinions are my own. Are you ready to call your friends and family over for brunch? 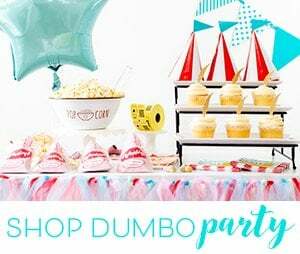 Read these ideas first for making it an event to remember. We’ll keep it simple so that you can enjoy your company, just the way it should be. Let’s create an abundantly simple feast fit for any special occasion on your calendar this spring. Serving brunch starts with the perfect dinnerware and serveware. I’m totally crushing on the Q Squared NYC collections right now. Not only are they stunning, but they are a 100% high-quality melamine product. When it comes to captivating your guests, their Captiva Collection is a perfect starting point for brunch celebrations this season. 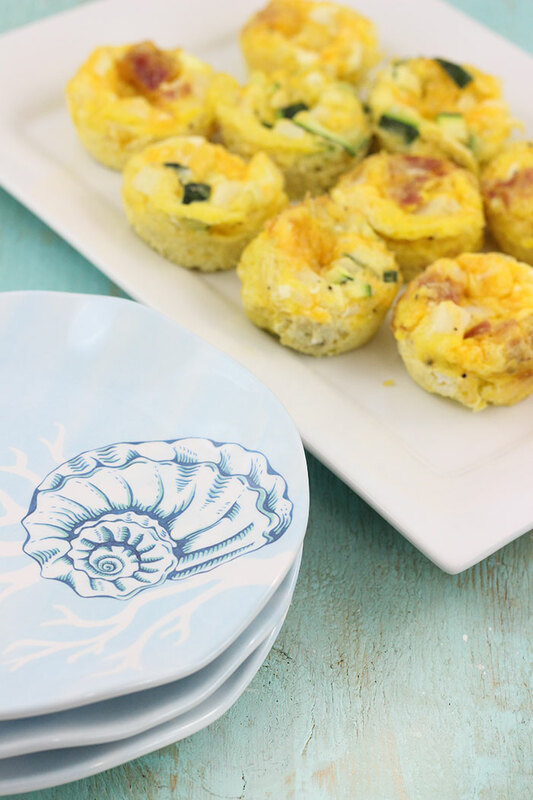 When I first saw them, I knew that I had to use their melamine plates and serveware to host my own brunch. Beauty meets practicality with the design and function. Each hand-drawn pattern mixes and matches in the most aesthetic way. This particular set reminds me of eating breakfast at an oceanfront resort, so I’m excited to be able to own these to create this whimsical mood right in my own home. Total bonus? 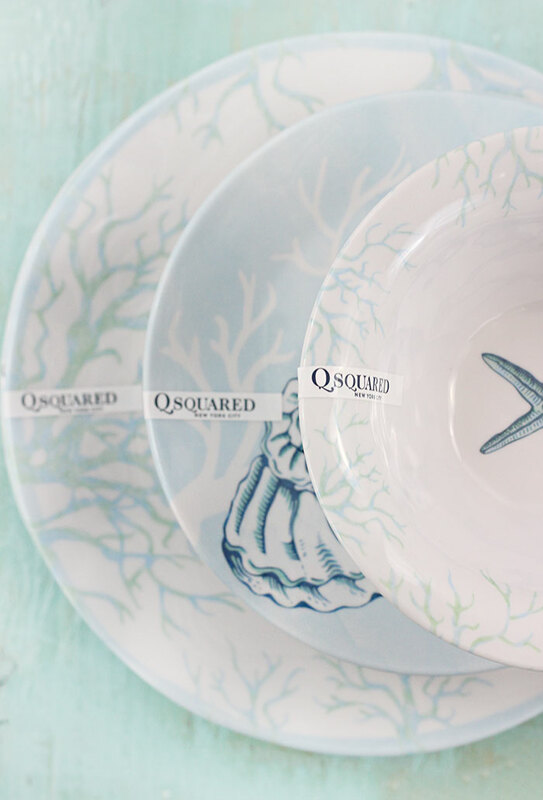 Q Squared NYC is 100% high-quality melamine and the best food-safe plastic on the market. So, inviting kids over for brunch won’t be a problem because, they’re also shatter-resistant. Score. Serving a wide range of the perfect brunch foods can be simple. First on my menu is always a big bowl of fruit salad. It can be as simple as serving chopped fruits and adding a sprig of mint to make it elegant. 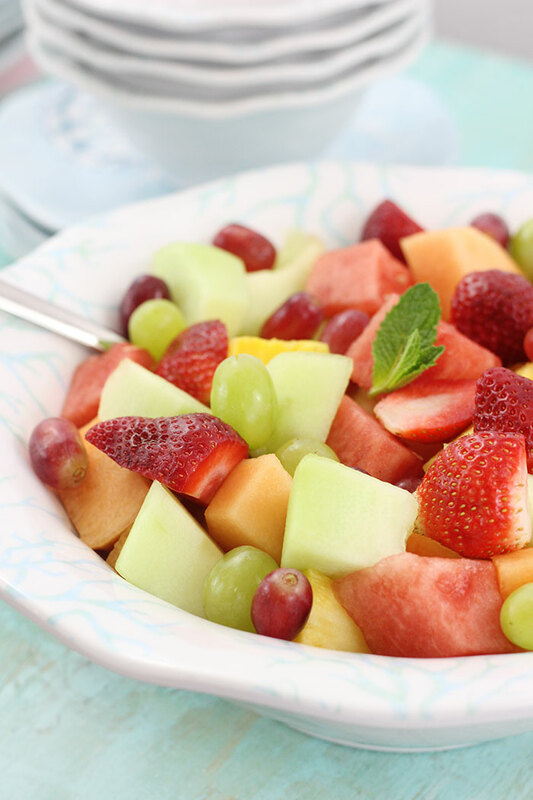 My favorite fruits for this are watermelon, pineapple, melon, grapes and strawberries. 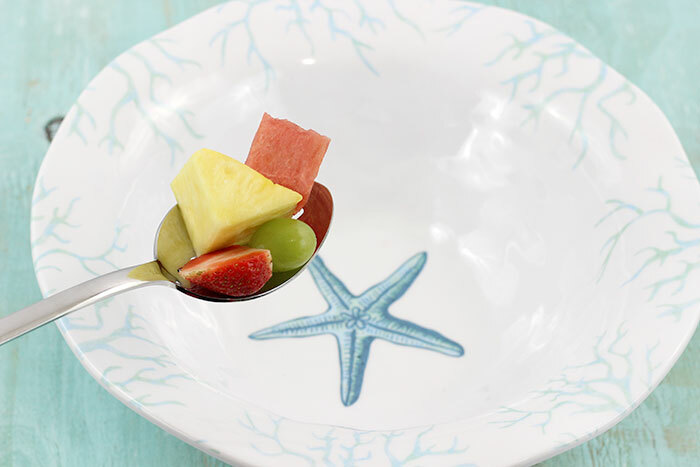 For the perfect fruit salad, the Captiva Collection Serving Bowl is the perfect size and adds an element of beauty to your table. Eggs make the perfect main dish for brunches. 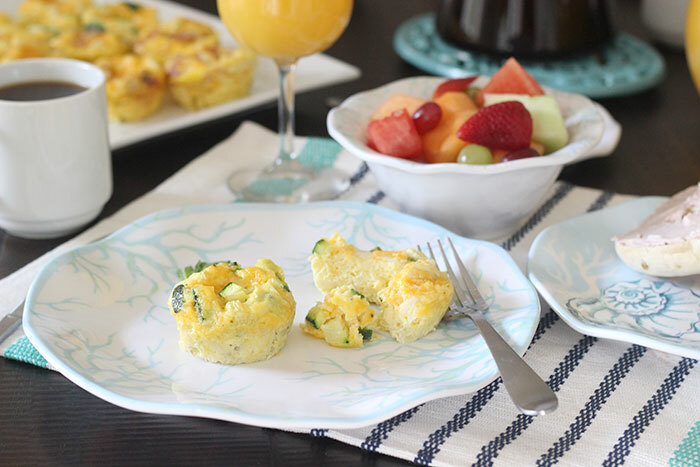 My absolute favorite brunch food at home are egg muffins, they are basically mini omelets in muffin form. You can easily make these using muffin tins. Make a variety of flavors so that your guests can enjoy their favorites. I made a veggie variety using zucchini, onions and cheddar cheese as well as a variety using bacon and cheddar cheese. I love adding brunch meats like bacon into these to avoid having to keep them warmed and separate. These egg muffins can also be made in advance, making them the perfect simple entree. Brunch sides made simple? 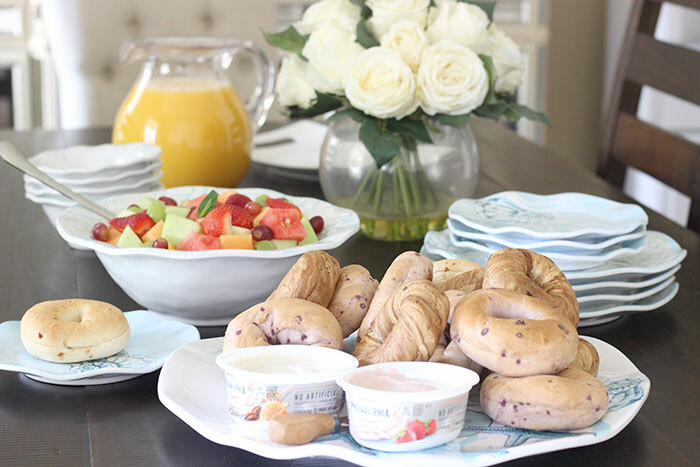 Create a bagel and cream cheese serving platter. 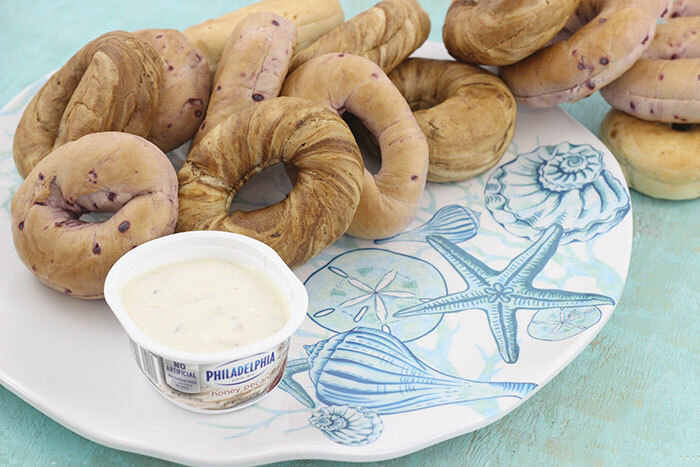 Offer up a variety of bagel options and cream cheese flavors. The Captiva Platter from Q Squared NYC is amazing for serving a variety of offerings for your guests. This might just be my favorite piece from this collection. I absolutely love large serving platters for hosting gatherings. I’m totally smitten by the design and size of this platter. Other tasty brunch sides include freshly baked rolls, mini muffins, cinnamon rolls and pastries. For a simple brunch, I choose to serve orange juice and hot coffee. I can’t think of a combo that I love more. If you want to make things a little more fancy, you can simply add a splash of sparkling water or lemon lime soda to the OJ or even serve up Mimosas. To take your hosting skills to the next level, consider looking at Q Squared NYC. Their company was founded by a mother-daughter team back in 2011. Their goal is to offer inspirational, yet practical 100% high-quality melamine products and they totally succeeded. Each of the collections you’ll find are hand-drawn by Alaina, the daughter of the dynamic duo. I think you’ll enjoy the craftsmanship as much as I do. Did you fall in love with this Q Squared NYC collection, too! You’re in luck! I have a special coupon code for my readers! PRIZE: A 12 piece set of your favorite Q Squared NYC collection. Happy brunching! I shared my favorite, now it’s your turn. Tell me which of the Q Squared NYC collection you would love for your next brunch to enter to win your own 12 pc. set. Leave your comment below to be entered. I would love the Heritage collection! Hi Katherine! I am processing the winner's info now and will include it in the post for everyone to see ;) Thanks for entering! I love the Diamond Round. The Pembroke collection features beautiful colors and elegant design. It is the perfect mixture of classic and modern styling. I love the Limonata Collection! It is so me and my taste! We like the Medina Collection ! I like the Diamond Round--so classic! I love the PEMBROKE 12PC MELAMINE DINNERWARE SET, I love the color, and its very simple, yet elegant. Diamond Square is my favorite collection. I love the Peony set! It was so hard to choose! I would absolutely love the Knoll Gardens 12pc Melamine Dinnerware Set! Although ALL of the sets are gorgeous and very colorful and festive. Thank you for this awesome giveaway opportunity! These are all so gorgeous, any one of the collections is something I'd be happy with. Right this second, I would say my favorite is Royal Lapis. Thanks for the chance to win. I am super in love with the Hampton Toile 12PC dinner set! I have never seen anything quite like it before. I would love for it to grace my kitchen. Really, REALLY hard to choose my favorite, but it would be either the Ruffle in Pebble or the Portsmouth. Or maybe the Yuletide for Christmas! Those are gorgeous place settings! My Favorite set is the CAMBRIDGE ROSE IN COBALT or Crimson. Oh they are gorgeous!! Oh wow, they are all so pretty!!! I love the solids, but really think the Nautical is awesome for by the pool! Your creations are gorgeous!!! So pretty! I love the LIMA from the tiled collection or the LIMONATA from the floral. So many great choices! These are gorgeous. I think the Royal Lapis is my favorite if I had to pick only one. So many fantastic options!!! I'm loving the Pembroke collection, but also the Portsmouth. The Lima collection is my fav! These are stunning and I truly find all of the collections to be beyond gorgeous! I think the TALAVERA IN NATURAL is my top favorite. I love your Captiva set, but I would LOVE the Ruffle in Pebble 12pc Melamine collection. I love it in the spruce, too! I love the Captiva collection the most. I love the whole ocean look of everyone. It's a very beautiful set. 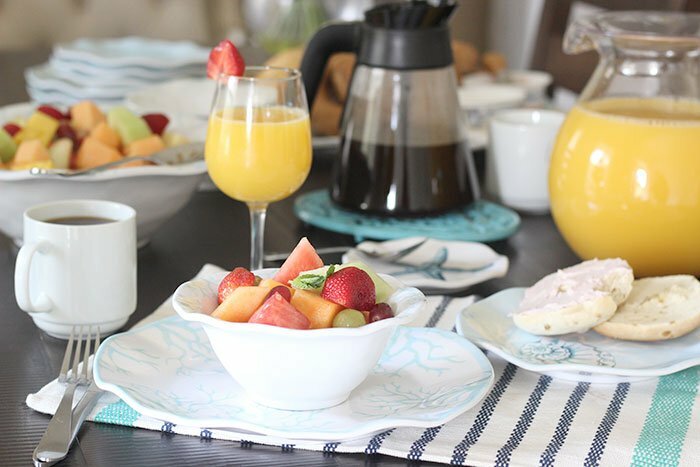 this is seriously the most perfect brunch ware! I love all the designs but feel like the Essex one has my name written all over it! Would LOVe to win! I'm all about minimalism so the Signature Whiteware is perfect for me. The Limonata set is my favorite. I have been obsessing over lemon prints lately and those are SO cute. I love most of the patterns. I really do like the RUFFLE IN PEBBLE 12PC MELAMINE DINNERWARE SET. Very different and I love the color. Tough choice - they are all beautiful. The Essex design with the square plates really caught my eye!! Thanks so much for doing this fabulous giveaway!!! I am crazy about the Limonata set. It's gorgeous and summery and fun! Cambridge Rose in cobalt is beautiful. I would like to get the Portsmouth 12pc Melamine Dinnerware Set. I really like the Captiva Collection. It's so nice and cute at the same time. I like the Lima set. Ruffle in paprika is my favorite one so pretty. They're all pretty but I love the Yuletide collection the best! I love the peony collection! So pretty! Your brunch is amazing!! You've really inspired me to have one! Your captiva set looks so put together. I'm thinking that Ruffle Dinnerware or the Diamond Square would be a perfect option for me. So versatile!! 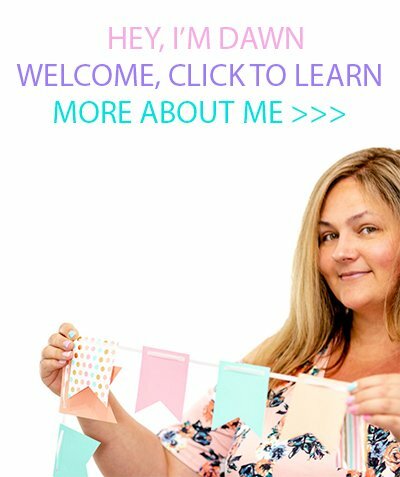 Thanks so much for this fab post!! i love the captiva collection. it is very cute. I like the Lima collection. THank you for the chance! I would love the royal lapis design! It reminds me of my grandmother's tiled bar.So beautiful! The captiva collection is nice. I love the Captiva collection like you have here! I love ocean life and this is the only set that comes close to capturing it! The Captiva is my favorite. It matches my decor. My favorite is the Ruffle in Spruce. I love the color! Thank you! My favorite collection is the Captiva collection. I love it! Thanks for the chance. I would love to set my reception table with the Knoll Gardens Collection. Its a romantic celebration and this pulls some heart strings for me. I love the floral colors and layout of them. Beautiful and worthy of my big day! This brunch looks amazing! I love a good fruit salad. I would pick the bright colors on the Porto Chalé set! LIMONATA 12PC MELAMINE DINNERWARE SET is my favorite. My favorite is the Yuletide pattern. I know it's a Christmas theme, but I would actually use that every day. I really like Porto Chale! So colorful! I absolutely love the Porto Chale pattern. I love the colors. I like the MEDINA collection. Thank you! I think the PEMBROKE is a lovely set. My favorite set is the diamond square set. My favorite collection is the CLASSICA IN BLACK 12PC MELAMINE DINNERWARE SET. I like the classic and simple elegance. Oh my daughter Loves the signature white ruffle, as she would use holiday decor to suit the seasons for her tea parties. I love the Cambridge Rose in Cobalt. ThePeony in white collection is the one I would choose. Thanks! I really like the PORTO CHALÉ set, Great vibrant colors. I love the Diamond Square! It is simple yet elegant and great for dinner parties. Diamond Square 12pc Melamine Dinnerware Set! So many favorites but going with the CAPTIVA COLLECTION, just love it!!! Such a difficult choice. I like the Tiled collection. I really like the Essex collection. It looks like fancy frames. i really like captiva collection,the CAMBRIDGE ROSE IN COBALT is nice too. My favorite collection is Lima. CLASSICA IN BLACK is my favorite. I like the Ruffles In Earth Hues Collection. Limonata, it's so fresh and fun looking! The Portsmouth set is my favorite. I'm a huge fan of the PORTO CHALÉ MELAMINE DINNERWARE SET! i love the ESSEX 12PC MELAMINE DINNERWARE SET anything gold has me sold. I really like the RUFFLE IN LINEN 12PC MELAMINE DINNERWARE SET...very nice. The Captiva collection is my favorite love the beachy feel and blue color! My favorite is the CAMBRIDGE ROSE IN COBALT. My favorite collection is the Lima. I love the CAMBRIDGE ROSE IN COBALT 12PC SET. Thanks for the chance! My favorite is the Lima Collection. I love the pattern and the colors. I love the CAMBRIDGE ROSE IN CRIMSON. I love, Love, LOVE the Hampton Toile pattern! it is hard to chose, there are so many that i love. it comes down to 2, the Peony and the Knoll Gardens. i guess i would chose the Knoll Gardens since i already have 2 sets of white dishes. these are so lovely. thank you. Love them all, but if I had to choose, I'd pick Captiva as I'm sure using them would put me in a relaxed mood. I really like the Cambridge Rose collection. Hard to make a choice, but really love the Captiva ! Oh goodness. So many I love. The Captiva captured my heart first though. Love it! Wow, SO many great styles. So hard to pick. My kitchen is blue, but I also like adding splashes of other colors. Hmmmm... I think I'd pick the Ruffle in Sapphire set, although the Mist Blue color is nice, too. That is a gorgeous looking brunch! My fiance' loves to cook and then plate and take photos of his creations. I love the Ruffle collection but I also love the Hampton Toile collection. I am torn between the two. Their products are just so pretty! Aren't they gorgeous? I'm with you, they make it really hard to just pick one favorite! I really like the Captiva collection and also the Royal Lapis collection. My favorite is the PALAZZO 12PC MELAMINE DINNERWARE SET. My favorite design is the Ruffle in Mist Blue. My favorite is the TALAVERA IN ROJA collection. I love the Diamond Square set. I absolutely love the Lima collection!! Love the Captiva as I live in florida! I love the ruffle collection! Ruffle in white, ruffle in earth tones, ruffle serve pieces. I love it all! I like the Classica in Black. My favorite design is the Zen collection. There are so many cute collections, but I think my favorite is also CAPTIVA. Second is the Peony collection. Though they all look awesome, the collection that I like the most is the Captiva. I love the ocean style! What a gorgeous brunch spread!! I would love to own the Limonatta set which is so summery and vibrant! Thank you for the chance. My favorite from Q Squared NYC Collection is Essex. It's bold with graphic patterns and metallics! Perfect for a fun gathering with friends. Oh I love the Portsmouth Set.. they would go with my lighthose collection. Porto Chalé is my favorite. The vibrant color and brightness would make any meal stand out and appealing.